A woman named Christine (Lyn Bari) walks along the beach when she thinks that she hears the voice of her husband calling out her name. The only problem is that her husband has been dead for two years. Christine’s sister, Janet (Cathy O’Donnell), says that Christine is just hearing things and that she needs to move on from mourning. After all, her boyfriend, Martin (Richard Carlson), is on the verge of asking Christine to marry him…. And yet, Christine can’t escape the feeling that her husband is trying to contact her from beyond the grave. During another walk along the beach, she runs into a handsome man who introduces himself as being Alexis (Turhan Bey). Alexis says that he’s a medium and that he has the power to speak to the dead. Furthermore, he tells Christine that he can speak to her dead husband for her. Despite the fact that Alexis owns a really impressive crystal ball, Martin is skeptical of his claims. Martin even goes so far as to hire a private investigator (Harry Mendoza) to investigate Alexis’s past. Meanwhile, though she has her suspicions, Janet finds herself falling in love with the charming Alexis…. Released in 1948, The Amazing Mr. X is an unjustly obscure little mystery film. Though I guess it’s open to debate whether it should be considered a horror film or just a noirish thriller, The Amazing Mr. X is full of creepy atmosphere and eerie moments. 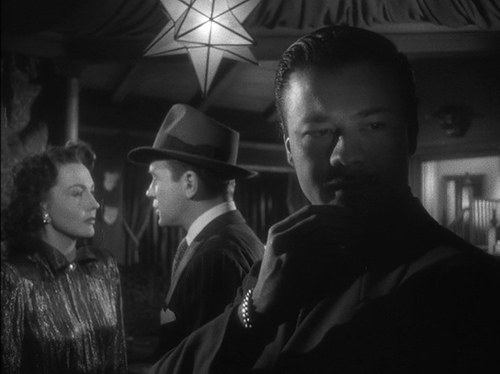 Employing expressionistic camera angles and dark lighting, director Bernard Vorhaus turns The Amazing Mr. X into a dream of dark and forbidden things. Some of the black-and-white shots are simply stunning and the seance sequence is brilliantly done. The film is also well-acted by a cast of actors who deserve to be better remembered. Lynn Bari is perfectly fragile and sympathetic as the haunted Christine while Cathy O’Donnell turns the potentially boring Janet into a compelling character. The film even makes good use of Richard Carlson’s reliable dullness by casting him as the one character who is meant to be a force of stability in Christine’s otherwise neurotic life. Like all good mysteries, The Amazing Mr. X has a third act twist that you probably won’t see coming and it ends with the proper combination of tragedy and redemption. 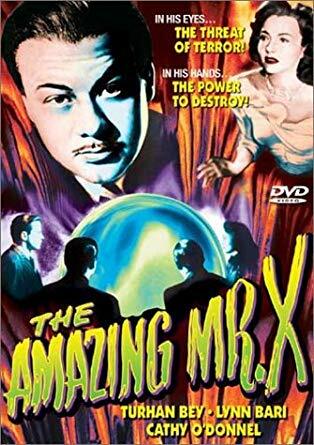 The Amazing Mr. X is currently in the public domain and can be viewed on YouTube so check it out! You won’t be sorry!